Check out confirmed details about Group H Teams, Schedule, Predictions for the upcoming 2018 FIFA World Cup in Russia. 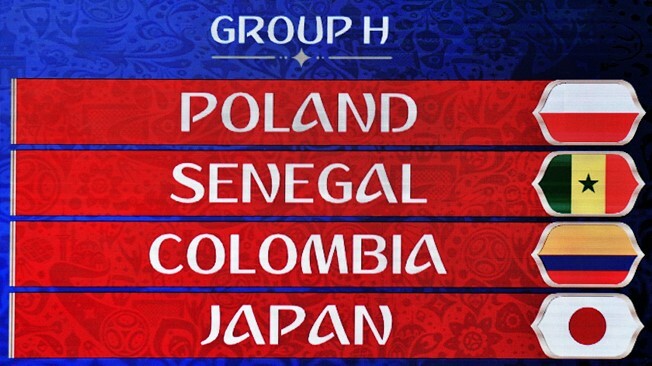 There will be a global feel to Group H at the 2018 FIFA World Cup Russia™, with top seed Poland drawn alongside African qualifiers Senegal, Colombia from South America and Asian powerhouse Japan. It is the only group not to have a team that has won football’s biggest prize. Poland played last time in 2006 where they were knocked out in group stage. After missing the qualifying chances for next two world cup, Poland is ready to make their appearance as the top seed team. African nation Senegal is making their appearance in the world cup for the second time. The first time they played in the world cup it was 2002 and they managed to reach the quarter finals where they were defeated by Turkey. Colombia’s best run was is 2014 world cup when they won the round of 16 and entered the quarter finals. It would be their sixth appearance. Asian powerhouse Japan had not entered the world cup till 1994. But since 1998 they did not look back and now are making sixth consecutive appearance. Japan has not reached in quarter finals till date. This group is most open of all groups. Poland won 8 of total 10 matches and lost only 1. They were selected as a top seed team as their rank was 5. Poland’s star player Robert Lewandowski was the top scored in the qualifying campaign with 16 goals. Senegal's exploits in 2002 are unforgettable, and their team is strong again. They did not lost a single game in the qualifying stage and conceded mere 5 goals in 8 games. Latin Americans Colombia qualified by standing at the last possible direct qualifying spot. They even managed to beat Argentina during this stage. James Rodriguez captained side has something to prove. Japan was first in their qualifying group and defeated Asian champions Australia too. But still Asian sides struggle in world cup against big sides. Poland was among the weakest top seeds, and Colombia will harbour ambitions of finishing first. Japan and Senegal, though, will both see the Round of 16 as a real possibility now.